Most of the time, images of wildlife approaching are better than those of wildlife going away. The problem is, where the wildlife is going to go is not always predictable. It is much easier to follow wildlife than to stay ahead of it. These incredibly-cute twin white-tailed deer fawns were with their mother and she was meandering through the woods, feeding in a seemingly random manner. I was constantly adjusting my position, trying to be in the right place as they passed through a potentially good scene. When I saw the adorable little fawns headed for a fern-bordered clearing, I immediately saw the potential image and moved into position. I couldn't have requested a better direction, though they came through very fast. With the Canon EOS-1D X Mark II in high speed burst mode, I was able to capture a string of images as they came through. The fast frame rate afforded me the opportunity to be quite selective, choosing my favorite body positions. This one stood out to me for the symmetry in the fawns' stride along with their head positions. Photographing in the woods with direct sunlight reaching through the canopy makes lighting very challenging. The giant overhead softbox that a cloudy day creates resolves that problem and this day had been perfect. There was direct sunlight in the early morning, providing great warm lighting in the fields of Big Meadows. As the sun rose and the lighting cooled, cloud cover rolled in and provided great light for photographing in and near the woods all day long. This image was captured at 2:39 PM on a late spring day. But, just because the lighting is good does not mean that the animals will be there. Deer typically feed early and late in the day and finding them mid-day can be challenging. Many photographers don't feel that mid-day is worth their time. Perhaps I'm not that smart, but ... this mother had two hungry little ones to feed and was in need of additional meals. I was out hunting for subjects and our paths crossed. As I've mentioned before, a monopod is faster to setup and adjust than a tripod and the monopod was a key part of my kit on this encounter. Being able to set up fast enabled me to position myself closer to where the fawns currently were, making the ideal position prediction more accurate. Another fawn photography tip I'll share is the timing for fawn photography. You will probably agree that fawns are their cutest just after birth, before they grow very rapidly. 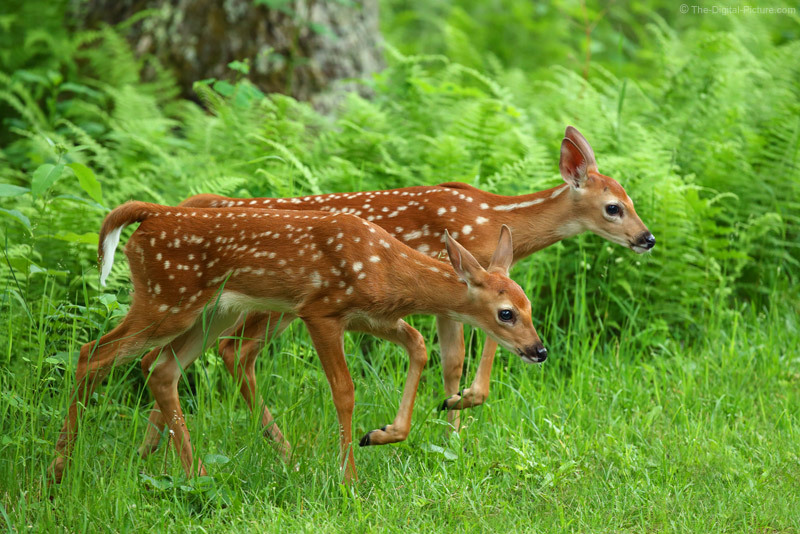 But, newborn fawns are not as active as those a week or two old. The newborns stay hidden in their beds a significant percentage of the time, making them harder to photograph. If your time is short and you want your encounter rate increased, consider timing your photography trip for a week or two later than you would for just-born fawns.